Calgary is the largest city in the province of Alberta, Canada. 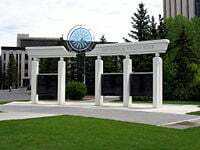 The city is located in the south of the province, in a region of foothills and high plains, approximately 80 kilometres (50 mi) east of the Canadian Rockies. Calgary is well-known as a destination for winter sports and ecotourism with a number of major mountain resorts near the city. Economic activity in Calgary is mostly centered on the petroleum industry; however, agriculture, tourism, and high-tech industries also contribute to the city's fast economic growth. The ascending price of oil in the late 1990s and early 2000s has triggered an economic boom in Calgary with a corresponding influx in population growth. Consequently, the city has one of the fastest growing populations in Canada. Despite the expanding city sprawl, Calgary was ranked the World's Cleanest City by Mercer Quality of Living Survey released by Forbes Magazine in 2007. In 1988, Calgary became the first Canadian city to host the Olympic Winter Games. The metropolis is also home to many major annual festivals including the Calgary Stampede, the Folk Music Festival, the Lilac Festival, Wordfest: Banff-Calgary International Writers Festival, One World Festival (GlobalFest), and the second largest Caribbean festival in the country (Carifest). Before the Calgary area was settled by Europeans, it was inhabited by Pre-Clovis people whose presence has been traced back to at least 11,000 years. In 1787 cartographer David Thompson spent the winter with a band of Piegan encamped along the Bow River. He was the first recorded European to visit the area and John Glenn was the first documented European settler in the Calgary Area, in 1873. The site became a post of the North West Mounted Police (now the RCMP). Originally named Fort Brisebois, after NWMP officer Éphrem-A Brisebois, it was renamed Fort Calgary in 1876 because of questionable conduct on the part of that officer. The NWMP detachment was assigned to protect the western plains from US whiskey traders. Fort Calgary was named by Colonel James Macleod after Calgary (Cala-ghearraidh, Beach of the pasture) on the Isle of Mull, Scotland. When the Canadian Pacific Railway reached the area in 1883 and a rail station was constructed, Calgary began to grow into an important commercial and agricultural centre. The Canadian Pacific Railway headquarters are located in Calgary today. Calgary was officially incorporated as a town in 1884 and elected its first mayor, George Murdoch. In 1894, Calgary became the first city in what was then called the Northwest Territories. Oil was first discovered in Alberta in 1902, but it did not become a significant industry in the province until 1947 when huge reserves of it were discovered. Calgary quickly found itself at the centre of the ensuing oil boom. The city's economy grew when oil prices increased with the Arab Oil Embargo of 1973. The population increased by 254,000 in the seventeen years between 1971 (403,000) and 1988 (657,000) and another 335,000 in the next eighteen years following (to 992,000 in 2006). During these boom years, skyscrapers were constructed at a pace seen by few cities anywhere. The relatively low-rise downtown quickly became dense with tall buildings, a trend that continues to this day. Calgary's economy was so closely tied to the oil industry that the city's boom peaked with the average annual price of oil in 1981. The subsequent drop in oil prices and the introduction of the National Energy Program were cited by industry as reasons for a collapse in the oil industry and consequently the overall Calgary economy. The NEP was cancelled in the mid-1980s by the Brian Mulroney federal government. Continued low oil prices, however, prevented a full recovery until the 1990s. With the energy sector employing a huge number of Calgarians, the fallout from the economic slump of the early 1980s was understandably significant. The unemployment rate soared. By the end of the decade, however, the economy was in recovery. Calgary quickly realized that it could not afford to put so much emphasis on oil and gas, and the city has since become much more diverse, both economically and culturally. The period during this recession marked Calgary's transition from a mid-sized and relatively nondescript prairie city into a major cosmopolitan and diverse centre. This transition culminated in February of 1988, when the city hosted the XV Olympic Winter Games. The success of these games essentially put the city on the world stage. Since the late 1990s, the economy in Calgary and Alberta has been booming, and the region of nearly 1.1 million people is the fastest growing in Canada. While the oil and gas industry comprise most of the economy, the city has invested a great deal into other areas. Tourism is perhaps one of the fastest growing industries in the city. Over 3.1 million people now visit the city on an annual basis for its many festivals and attractions, as well as the Calgary Stampede. The nearby mountain resort towns of Banff, Lake Louise, and Canmore are also becoming increasingly popular with tourists, and are bringing people into Calgary as a result. Other modern industries include light manufacturing, high-tech, film, transportation, and services. The city has ranked highly in quality of life surveys: 25th in the 2006 Mercer Quality of Living Survey, and 10th best city to live in according to the Economist Intelligence Unit (EIU). Despite the oil industries dominance in Alberta's economy, Calgary ranked as the world's cleanest city by Forbes Magazine in 2007. Calgary is located at the transition from the Canadian Rockies foothills and the Canadian Prairies and is relatively hilly as a result. 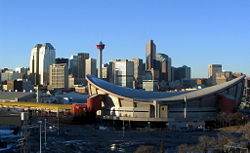 Calgary's elevation is approximately 1,048 metres (3,440 ft) above sea level downtown, and 1083 metres at the airport. The city proper covers a land area of 721 square kilometres (278 sq mi) (as of 2001) and as such exceeds the land areas of both Toronto and New York City. There are two major rivers that run through the city. 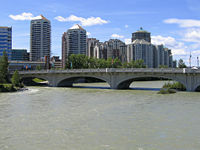 The Bow River is the largest and flows from the west to the south. The Elbow River flows northwards from the south until it converges with the Bow River near downtown. Since the climate of the region is generally dry, dense vegetation occurs naturally only in the river valleys, and on some north-facing slopes. Calgary has a semi-arid, highland continental climate with long, dry, but highly variable, winters and short, moderately warm summers (Koppen climate classification BSk, USDA Plant Hardiness Zone 3b). The climate is greatly influenced by the city's elevation and close proximity to the Rocky Mountains. Although Calgary's winters can be uncomfortably cold, they are usually tempered by the periodic arrival of warm, dry Chinook winds, which routinely blow into the city from the Pacific Ocean, giving Calgarians a break from the cold. These winds have been known to raise the winter temperature by up to 15°C (59°F) in just a few hours, and may last several days. The chinooks are such a common feature of Calgary's winters that only one month (January 1950) has failed to witness a thaw over more than 100 years of weather observations. More than one half of all winter days see the daily maximum rise above 0°C (32°F). Some winter days even approach 20°C (68°F) on occasion. Calgary is a city of extreme temperatures ranging from a record low of −45°C (-49°F) in 1893 to a record high of 36°C (97°F) in 1919. Temperatures fall below −30°C (-22°F) on about five days per year, though extreme cold spells usually do not last very long. According to Environment Canada, the average temperature in Calgary ranges from a January daily average of −9°C (16°F) to a July daily average of 16°C (61°F). As a consequence of Calgary's high elevation and relative dryness, summer evenings can be very cool, the average summer minimum temperature drops to 8°C (46°F), and frosts can occur in any month of the year. Calgary has experienced snowfall even in July and August. Calgary experiences summer daytime temperatures exceeding 30°C (86°F) on an average of four days per year. With an average relative humidity of 55% in the winter and 45% in the summer, Calgary has a semi-arid climate typical of other cities in the Western Great Plains and Canadian Prairies. Unlike cities further east, such as Toronto, Montreal, or even Winnipeg, humidity is almost never a factor during the Calgary summer. The city is among the sunniest in Canada, with 2,405 hours of annual sunshine, on average. Calgary International Airport in the northeastern section of the city receives an average of 413 millimetres (16.2 in) of precipitation annually, with 301 millimetres (11.8 in) of that occurring in the form of rain, and the remaining 112 millimetres (4.4 in) as snow. Most of the precipitation occurs from May to August, with June averaging the most monthly rainfall. In June of 2005, Calgary received 248 millimetres (9.8 in) of precipitation, making it the wettest month in the city's recorded history. Droughts are not uncommon and may occur at any time of the year lasting sometimes for months or even years. Precipitation decreases from west to east; consequently, groves of trees on the western outskirts largely give way to treeless grassland around the eastern city limit. Calgary averages more than 20 days a year with thunderstorms, with almost all of them occurring in the summer months. Calgary lies on the edge of Alberta's hailstorm alley and is prone to occasional damaging hailstorms. A hailstorm that struck Calgary in September 7, 1991 was one of the most destructive natural disasters in Canadian history, with over $400 million dollars in damage. Calgary's urban scene has changed considerably since the city has grown. The city has also started to become recognized as a modern cosmopolitan destination that still retains much of its traditional culture of hotel saloons, western bars, night clubs, and hockey. Following its revival in the 1990s, Calgary has also become a centre for country music in Canada. As such, it is referred to by some as the "Nashville of the North." Calgary is also home to a thriving all-ages music scene of many genres, including pop, rock, hip-hop, electronic and country. As a relatively ethnically diverse city, Calgary also has a number of multicultural areas and assets. It has one of the largest Chinatowns in Canada as well as a “Little Italy” in the Bridgeland neighborhood. Forest Lawn is among the most diverse areas in the city and as such, the area around 17th Avenue SE within the neighborhood is also known as International Avenue. The district is home to many ethnic restaurants and stores. As the population has grown, and particularly, as the urban density in central Calgary has increased, so too has the vitality of this area. While the city continues to embrace suburbanism, people are beginning to find a wide variety of alternatives in the inner city. This has led to significant increases in the popularity of central districts such as 17th Avenue, Kensington, Inglewood, Forest Lawn, Marda Loop and the Mission District. The nightlife and the availability of cultural venues in these areas have gradually begun to evolve as a result. Calgary is the site of the Southern Alberta Jubilee Auditorium (The Jube), a 4 million cubic foot (113,000 m³) performing arts, culture and community facility. The 2,700-seat auditorium was opened in 1957 and has been host to hundreds of Broadway musical, theatrical, stage and local productions. Annually, over 850,000 visitors frequent the performance space. The Calgary Jube is the resident home of the Alberta Ballet, the Calgary opera, the Kiwanis Music Festival, and the annual civic Remembrance Day Ceremonies. Both auditoriums operate 365 days a year, and are run by the provincial government. The city is home to several museums. The best-known of these, the Glenbow Museum is the largest in western Canada and includes an art gallery. Other major museums include the largest Chinese Cultural Centre in North America, the Canadian Olympic Hall of Fame (at Canada Olympic Park), The Military Museums, the Cantos Music Museum and the Aero Space Museum. There are also a number of art galleries in the city and many of them are concentrated along the Stephen Avenue and 17th Avenue corridors. The largest of these is the Art Gallery of Calgary (AGC). Calgary is home to a number of major annual festivals and events. Calgary has a thriving festival scene with festivals being held all year round. These include the growing Calgary International Film Festival, the Calgary Folk Music Festival, The Greek Festival, Carifest, Wordfest Banff-Calgary International Writers Festival, the Lilac Festival, GlobalFest, the Calgary Fringe Festival, Summerstock, Expo Latino, and many other cultural and ethnic festivals. Calgary's most well-known event is the Calgary Stampede, which occurs every July. It features an internationally recognized rodeo competition, a midway, stage shows, agricultural competitions, chuck-wagon races, First Nations exhibitions, and pancake breakfasts around the city, among other attractions. It is one of the largest and best-known festivals in Canada. The event has a 93 year history. In 2005, attendance at the 10-day rodeo and exhibition totalled 1,242,928. In the summer, the Bow River is very popular among fly-fishermen. Golfing is also a very popular activity for Calgarians and the region has a large number of courses. (*) Established as the [[Atlanta Flames in 1972. Calgary's downtown features an eclectic mix of restaurants and bars, cultural venues, shopping and public squares. Downtown tourist attractions include the Calgary Zoo, the TELUS World of Science, the TELUS Convention Centre, the Chinatown district, the Eau Claire Market, the Glenbow Museum, the Calgary Tower, the Art Gallery of Calgary (AGC) and the EPCOR Centre for the Performing Arts. At 2.5 acres (1.01 ha), the Devonian Gardens is one of the largest urban indoor gardens in the world, and it is located on the 4th floor of TD Square (above the shopping). The downtown region is also home to Prince's Island Park, an urban park located just north of the Eau Claire district. Directly to the south of downtown is Midtown and the Beltline. This area is quickly becoming one of the city's densest and most active mixed use areas. At the district's core is the popular "17th Avenue," which is known for its many bars and nightclubs, restaurants, and shopping venues. Attractions on the west side of the city include the Heritage Park Historical Village historical park, depicting life in pre-1914 Alberta and featuring working historic vehicles such as a steam train, paddlewheel boat and electric streetcar. The village itself is comprised of a mixture of replica buildings and historic structures relocated from southern Alberta. Other major city attractions include Canada Olympic Park (and the Canadian Olympic Hall of Fame), Calaway Park amusement park, Spruce Meadows (Equestrian/Showjumping centre) and Race City Motorsport Park. In addition to the many shopping areas in the city centre, there are a number of large suburban shopping complexes in Calgary. Among the largest are Chinook Centre and Southcentre Mall in the south, WestHills and Signal Hill in the southwest, South Trail Crossing and Deerfoot Meadows in the southeast, Market Mall in the northwest, and Sunridge Mall in the northeast. The city also has a large number of urban parks including Fish Creek Provincial Park, Nose Hill Park, Bowness Park, Edworthy Park, the Inglewood Bird Sanctuary, Confederation Park, and Prince's Island Park. Nose Hill Park is the largest municipal park in Canada. Connecting these parks and most of the city's neighborhoods is one of the most extensive multi-use (walking, bike, rollerblading) path systems in North America. According the 2001 Statistics Canada federal census, there were 878,866 people living within the City of Calgary proper. Of this population, 49.9 percent were male and 50.1 per cent were female. Children under five accounted for approximately 6.0 per cent of the resident population of Calgary. This compares with 6.2 percent in Alberta, and almost 5.6 percent for Canada overall. In 2001, 9.0 percent of the resident population in Calgary were of retirement age (65 and over for males and females) compared with 13.2 percent in Canada, therefore, the average age is 34.9 years of age comparing to 37.6 years of age for all of Canada. In the five years between 1996 and 2001, Calgary's population grew by 15.8 percent. This is contrasted with an increase of 10.3 percent for the province of Alberta. The population density of Calgary averaged 1,252.3 persons per square kilometre (3,243/sq mi), compared with an average of 4.6 persons per square kilometre (11.9/sq mi), for the province. A city-administered census estimate, conducted annually to assist in negotiating financial agreements with the provincial and federal governments, showed a population of just over 991,000 in 2006. The population of the Calgary Census Metropolitan Area was just over 1.1 million, and the Calgary Economic Region posted a population of just under 1.17 million in 2006. On July 25, 2006 the 1,000,000th Calgarian was born and the census indicated that the population is rising by approximately 98 people per day. This date was arrived at only by means of assumption and statistical approximation and only took into account children born to Calgarian parents. A net migration of 25,794 persons/year was recorded in 2006, a significant increase from 12,117 in 2005. A majority of Calgarians declare themselves to be of European ancestry. This group comprises 79 percent of the population (688,465 people). Another 2.3 percent (19,765 people) of the population is Aboriginal. In addition, the city is home to a relatively large number of people belonging to visible minority groups. These groups include Chinese: 51,540 or 5.9 percent, South Asian: 37,370 or 4.2 percent, Filipino: 16,245 or 1.9 percent, Black Canadian: 13,370 or 1.5 percent, Latin American: 8,525 or 1.0 percent, and many others. Calgary is traditionally viewed as a conservative city, dominated by traditional small-c social conservatives and fiscal conservatives. As the city is a corporate power-centre, a high percentage of the workforce is employed in white-collar jobs. During the 1990s the city's mainstream political culture was dominated by the right-wing Reform Party of Canada federally, and the Alberta Progressive Conservatives provincially. The Reform Party was founded in Calgary. 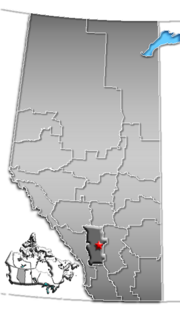 Calgary is governed in accordance with the Province of Alberta's - Municipal Government Act (1995). The citizens vote for members of the Calgary City Council every three years with the next vote in October 2007. City Council is comprised of the Mayor and 14 Ward Aldermen. The current Mayor is Dave Bronconnier who was first elected in 2001. The city has an operating budget of $2.1 billion for 2007, supported 41 percent by property taxes. $757 million in property taxes are collected annually, with $386 million from residential and $371 million from non-residential properties. 54 percent of the budget is spent for wages of the 13,043 city employees and expeditures. The average Calgary household pays $1,042 per year in city tax. Calgary is represented by 23 provincial MLAs including 20 members of the Progressive Conservatives and 3 members of the Alberta Liberals. For exactly fourteen (14) years (from 14 December 1992 to 14 December 2006), the provincial premier and leader of the Progressive Conservative Party of Alberta, Ralph Klein, held the Calgary Elbow seat. Mr. Klein was elected to the Legislative Assembly of Alberta in 1989 and resigned on September 20, 2006. He was succeeded as provincial premier and leader of the Progressive Conservative Party by Mr. Ed Stelmach, MLA for Fort Saskatchewan-Vegreville. Following this leadership change Calgary saw its leadership and representation on provincial matters further reduced as its representation on the provincial cabinet was reduced from eight to three  with only one Calgary MLA, Greg Melchin, retaining a cabinet seat. In May 2007, former premier Ralph Klein's riding, a seat the dynasty has held since it took office in 1971 fell to Alberta Liberal Craig Cheffins during a bi-election. Voters appeared to have been angry over Premier Ed Stelmach's dismissal of booming Calgary's struggles to deal with everything from traffic gridlock to soaring rents and house prices. In 2007, all eight of Calgary's federal MPs were members of the Conservative Party of Canada (CPC). The CPC's predecessors have traditionally held the majority of the city's federal seats. 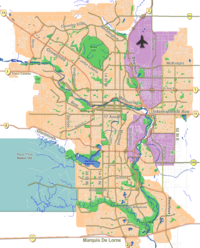 Also in 2007, the federal electoral district of Calgary-Southwest was held by Prime Minister and CPC leader Stephen Harper. Coincidentally, the same seat was also held by Preston Manning, the leader of the Reform Party of Canada, a predecessor of CPC. Joe Clark, former Prime Minister and former leader of the Progressive Conservative Party of Canada (also a predecessor of the CPC), held the riding of Calgary Centre. Of Canada's 22 serving Prime Ministers, two have served terms representing a Calgary riding while Prime Minister. The first was the Right Honourable Richard Bennett from Calgary West who held that position from 1930 to 1935. Calgary's economy is dominated by the oil and gas industry, despite recent diversification. The city is home to 87 percent of Canada's oil and natural gas producers and 66 percent of coal producers. As of 2005, Calgary had a labor force of 649,300 (a 76.3 percent participation rate) and, at 3.1 percent, one of the lowest unemployment rates in Canada. There are approximately 50 million square feet of office space in the city, with approximately 32 million of these within the downtown commercial core. Calgary is the site of five major public post-secondary institutions. The University of Calgary is the city's primary large degree-granting facility. Approximately, 28,000 students are enrolled there. Mount Royal University is the city's second largest institution (approximately 13,000 students), and it grants degrees in a number of fields. SAIT Polytechnic provides polytechnic education and grants certificates, diplomas and applied degrees. The Main Campus is in the North West Quadrant, just north of downtown. 2 other campus provide specific training. Bow Valley College's main campus is located downtown and provides training in business, technology, and the liberal arts for about 10,000 students (the college has three campuses in Calgary and numerous in the region). The Alberta College of Art and Design (ACAD) is located in Calgary. In addition, the University of Lethbridge has a satellite campus in the city. There are also several private liberal arts institutions including Ambrose University College, official Canadian university college of the Church of the Nazarene and the Christian and Missionary Alliance and St. Mary's University College. There are a number of other smaller private colleges in the city. Calgary is also home to DeVry Career College's only Canadian campus. In the year 2005, roughly 97,000 students attended K-12 in about 215 schools in the English language public school system run by the Calgary Board of Education. Another 43,000 attend about 93 schools in the separate English language Calgary Catholic School District board. The much smaller Francophone community has their own French language school boards (public and Catholic), which are both based in Calgary, but serve a larger regional district. There are also several public charter schools in the city. Calgary has a number of unique schools, including the country's first high school exclusively designed for Olympic-calibre athletes, the National Sport School. Calgary is also home to many private schools including Strathcona Tweedsmuir, Rundle College, Clear Water Academy, Webber Academy, Masters Academy and West Island College. Calgary is considered a transportation hub for much of central and western Canada. Calgary International Airport (YYC), is the fourth largest airport in Canada by passenger movements and is also a major cargo hub. Calgary's presence on the Trans-Canada Highway and the Canadian Pacific Railway (CPR) mainline also make it an important hub for freight. Calgary no longer has regular interurban passenger rail service but CPR still operates a passenger railway station for rail tour companies at Palliser Square. 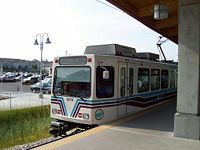 Calgary Transit provides public transportation services throughout the city with buses and light rail. Calgary's rail system, known as the CTrain was one of the first such systems in North America and consists of three lines (two routes) on 42.1 kilometres (26.2 mi) of track (mostly at grade with a dedicated right-of-way carrying 42 percent of the downtown working population). Light rail transit use within the downtown core is free. The bus system has over 160 routes and is operated by 800 vehicles. As an alternative to the over 260 kilometres (162 mi) of dedicated bikeways on streets, the city has a large interconnected network of paved multi-use (bicycle, walking, rollerblading, etc) paths spanning over 635 kilometres (395 mi). Calgary currently has three major hospitals; the Foothills Medical Centre, the Rockyview General Hospital and the Peter Lougheed Centre, all overseen by the Calgary Health Region. A medical evacuation helicopter operates under the auspices of the Shock Trauma Air Rescue Society. Calgary also has the Tom Baker Cancer Centre (located in the Foothills Medical Centre), Alberta Children's Hospital, and Grace Women's Health Centre providing a variety of care, in addition to hundreds of smaller medical and dental clinics. The University of Calgary Medical Centre also operates in partnership with the Calgary Health Region, by researching cancer, cardiovascular, diabetes, joint injury, arthritis and genetics. As a city that has experienced rapid growth in recent years, Calgary is having its share of growing pains. Among the most significant is that of urban sprawl. With no geographical barriers to its growth besides the Tsuu T'ina First Nation to the southwest and an affluent population that can afford large homes and properties, the city now has only a slightly smaller urban footprint than that of New York City and its boroughs, despite having less than one-eighth the population of New York City proper. This has led to difficulties in providing necessary transportation to Calgary’s population, both in the form of roadways and public transit. The result has also been a downtown which has traditionally lacked life on the evenings and weekends. It has also led to an interpretation of the city as being a “driver’s city.” With the redevelopment of the Beltline and the Downtown East Village at the forefront, efforts are underway to vastly increase the density of the inner city, but the sprawl continues nevertheless. In 2003, the combined population of the downtown neighbourhoods (the Downtown Commercial Core, the Downtown East Village, the Downtown West End, Eau Claire, and Chinatown) was just over 12,600. In addition, the Beltline to the south of downtown had a population of 17,200. Because of the growth of the city, its southwest borders are now immediately adjacent to the Tsuu T'ina Nation Indian reserve. Recent residential developments in the deep southwest of the city have created a need for a major roadway heading into the interior of the city, but with complications in negotiations the much-needed construction is delayed. Calgary has also struggled to find its own unique identity. On the one hand, it has relentlessly tried to maintain its western heritage. This has led to the popular nickname, "Cowtown." At the same time, the city has branded itself as being a modern economic and business centre. In recent years, Calgary has also become one of Canada's most cosmopolitan cities and has been evolving into a major cultural centre. These very different images have often resulted in ambiguity and confusion with regard to the direction of Calgary's continued development. Many socioeconomic issues have found their way into the city’s urban fabric in recent history. As the population grows, so does the rate of homelessness in the city. Certain neighbourhoods along with portions of downtown have commonly been singled out as being home to much higher proportions of disadvantaged residents. Many neighbourhoods in the city’s east have been particularly stereotyped this way. Although Calgary and Alberta have traditionally been affordable places to live, substantial growth (much of it due to the prosperous energy sector and the northern oil sands projects) has led to increasing demand on real-estate. As a result, house prices in Calgary have increased significantly in recent years. As of November 2006, Calgary is the most expensive city in Canada for commercial/downtown office space, and the second most expensive city (after Vancouver) for residential real-estate. In 2006, Calgary had the lowest unemployment rate (3.2 percent) among major cities in Canada, and as a result, there is an extreme shortage of workers, both skilled and unskilled. It is common to see signing bonuses for workers in the service industry. Downtown hotels have had to shut down floors due to a lack of staff to clean all the rooms. Calgary's housing boom, combined with large road construction projects and competition from oil fields with high wages to the north, has created a strain on the labor force. Even though Calgary has a relatively low crime rate when compared to other cities in North America, gangs and drug-related crime are becoming much larger issues than they have been in the past. Marijuana grow operations busts have decreased in 2005, while possession and trafficking have increased. ↑ Municipal Profile – City of Calgary. Alberta Municipal Affairs (September 17, 2010). Retrieved October 2, 2010. ↑ 2.0 2.1 Population and dwelling counts, for Canada, provinces and territories, and census subdivisions (municipalities), 2011 and 2006 censuses (Alberta). Statistics Canada (2012-02-08). Retrieved March 23, 2012. ↑ 3.0 3.1 Population and dwelling counts, for census metropolitan areas, 2011 and 2006 censuses. Statistics Canada (2012-02-08). Retrieved March 23, 2012. ↑ Robert Malone, Which Are The World's Cleanest Cities? Forbes Magazine (April 2007). Retrieved March 23, 2012. ↑ Based on single responses. Statistics are from the 2001 Statistics Canada census. Shiels, Bob. Calgary - A Not Too Solemn Look at Calgary's First 100 Years. The Calgary Herald, 1974. This page was last modified on 23 December 2016, at 16:59.